Explanation: Have you contemplated your home star recently? Pictured above, a Sun partially eclipsed on the top left by the Moon is also seen eclipsed by earthlings contemplating the eclipse below. 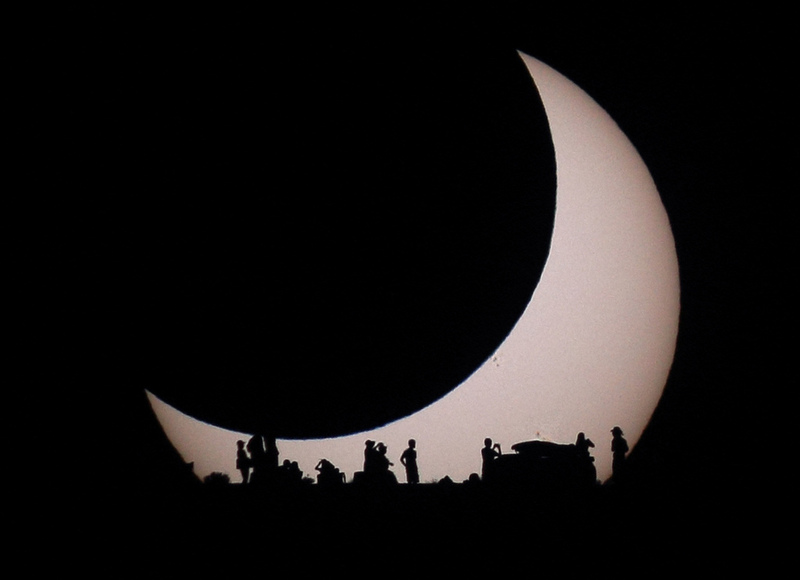 The above menagerie of silhouettes was taken from the Glen Canyon National Recreation Area near Page, Arizona, USA, where park rangers and astronomers expounded on the unusual event to interested gatherers. Also faintly visible on the Sun's disk, just to the lower right of the dark Moon's disk, is a group of sunspots. Although exciting, some consider this event a warm-up act for next week's chance to comtemplate the Sun -- a much more rare partial eclipse by the planet Venus.